A mightily impressive bass for the price. A tone range that ticks all the boxes. With its constantly-changing product range, it can be difficult to keep up with all the Ibanez models out there - but this update to the BTB range is worth your attention. With its natural vibe, plus a nine-piece laminate neck, a three-band EQ with a mid-frequency selector and Aguilar pickups, this bass looks like it means business. At £1299, the BTB 1805 is reasonably priced, considering the features and design elements which it incorporates. The elongated upper and lower horns stand out, and the cutaways offer extensive access to the upper regions of the 24-fret rosewood fingerboard. Visually, the warm timber colouring of the ash and rosewood bodywoods and the wenge, with its open grain, bubinga and maple neck laminates, work very well. To improve neck stability, graphite rods have been incorporated, providing additional reinforcement, while stainless steel frets have been included for durability. The Gotoh machine heads and monorail bridge saddles provide a little bling, and although the control set may look a little complicated, it actually makes a lot of sense in use, comprising volume, pickup pan, three-band EQ, an EQ bypass switch and a three-way mid-frequency selector switch. Abalone position markers adorn the upper side of the fingerboard, with white dots inlaid into the side of the neck, and a Neutrik locking jack socket is fitted as standard. 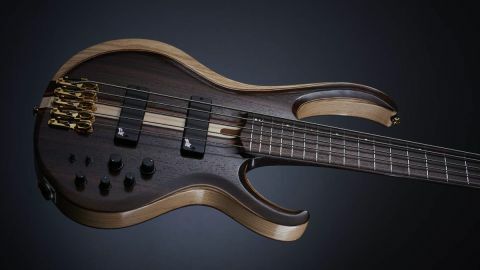 A bass such as this, with a through-neck construction and multiple timbers forming a neck and body sandwich, will always be at the mercy of the wood combination regarding its character and natural tone. This instrument is no exception - but even before plugging in, what becomes apparent is just how vibrant and lively this bass is. Frequencies resonate through the body in a very pleasing fashion; the degree of sustain is also impressive. Once plugged in, the bass doesn’t suffer from the mid-range bark typical of these designs. Ibanez have obviously done their homework, selecting timbers that work well together. Subsequently, the amplified tone is attractive, with depth and response across the whole neck. The low B string gives a fine account of itself, with a thorough tone that stands out without getting lost in the mix. The Aguilar DCB pickups are a fine addition and, matched with the Ibanez active circuit, supply plenty of tonal options. With the EQ bypass switch in use, the treble control becomes a passive tone pot, and the clarity of the active circuit is replaced by a warmer, and less clinical, sound. Panning across both pickups, and making use of the three different mid-EQ frequencies - 250hz, 450Hz and 700Hz - the flavours are extensive and should cater to most styles and genres. As with most Ibanez instruments we’ve reviewed in the past, playability is of paramount importance, and this bass firmly delivers on that score. The elongated body horns give the player something to push against, so it feels as if you’re working with the bass, not against it. The 19mm string spacing works in context and the shallow D-shaped neck profile is substantial enough to feel impressive without over-burdening the player’s fretting hand. The 35” scale, zero fret and wide rosewood fingerboard might sound like a daunting combination - but this isn’t the case at all. For the money, this is a very good five-string; lively and earthy, with lots of natural throatiness. It’s a real player’s instrument, with plenty to offer bassists of all levels and styles.